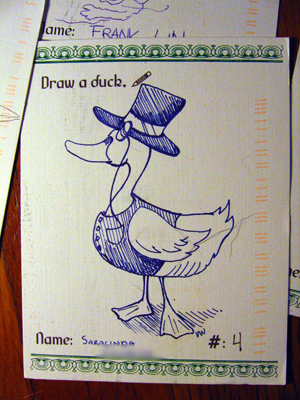 Mr. Lollipop's favorite animal is the duck. For his birthday one year ago I rented two ducks from a nearby farm and he spent the evening following them around the yard and smiling. Lots of work went into our invitations, so I wanted to try and draw some creativity our of our guests in return. Other than real ducks, what could be better for the water fowl obsessed man than armfuls of paper ducks from our loved ones? Plus, the paper kind don't poop everywhere or gorge themselves on our our garden herbs like the real thing. 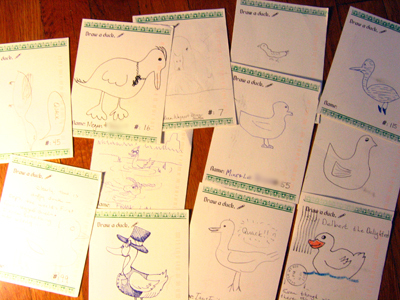 We've had a terrific response so far with lots of personal messages and notes. Only three party-poopers out of the more than thirty replies have returned without some kind of embellishment. 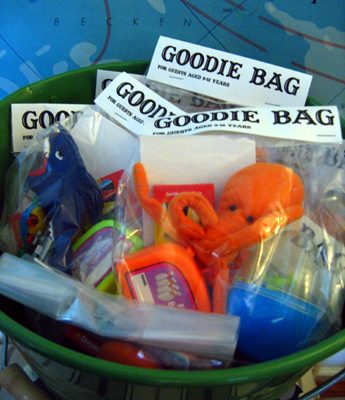 We will display the results at the reception and have a drawing for a prize. P.S. Numbering the invitations really saved out bacon. Quite a few came back with ducks but no names or nothing at all. Don't expect everyone to remember to write their names! Is it acceptable to ask the bride not to seat me next to someone in particular? Do you regret having spent all that money and energy on your big, splash-out wedding? How do I make my destination wedding enviro-friendly? Help my girlfriend and I gracefully decline a request to work the reception table. Again. And forevermore. Snappy comebacks, please, for the question: so, when are you going to have children? What needs to be done to get married in a church? Can anyone suggest interesting science-flavored demonstrations, experiments, or spectacles to be performed at a wedding? Entertainment alternatives to dancing at wedding party? When I was a little girl I was obsessed with the Funk and Wagnalls science encyclopedias available in our supermarket. The first volume covering A-Aq sold for only 9 cents so it was easy to talk my mother into buying a copy. For months, it was my most prized possession and I read from 'aardvark' to 'aquarium' savoring each entry. By far, my favorite entry was 'animal'. 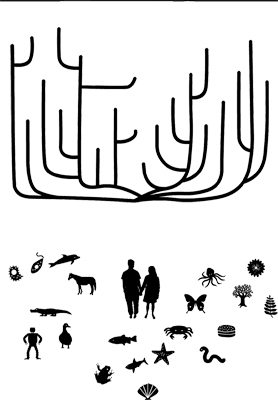 It contained a massive taxonomy tree covering two pages. I studied the chart like it was for a grade. Once we decided on a zoo reception venue, the chart sprang to mind as a convenient, organized way to incorporate and expand our animal theme. 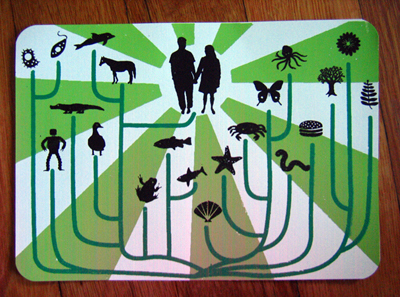 I drew many of the animal/plant/monera kingdom illustrations myself, though I nipped a few (namely the horse, butterfly and frog) from one of my copyright free illustration books and converted them to silhouettes. Screen printing the illustrations turned out to be time consuming. The green background took more than the usual amount on time because I wanted the color to go all the way up to the edges, so when we placed each card we needed to add scraps around the edges to keep the ink from smearing onto the back of the screen and smudging future copies. Doing this 200+ times really adds up. 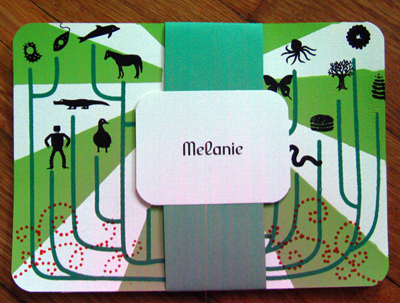 In addition, the tiny animal/plant/etc. illustrations lost details when we added more ink than needed. 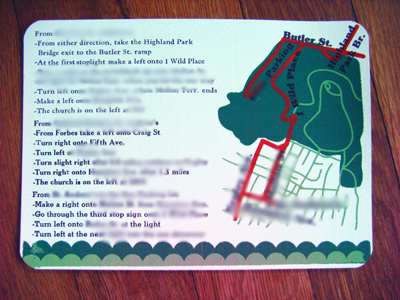 Therefore, we had to print reeeeally slowly and blot the screen at the first sign of trouble. Thanks goodness for the patience of our friends. We also had a fourth layer of ink, the dotted swirls in the illustration above, but I couldn't decide whether I liked the extra embellishment so only half of our invitations carry it. If you really want to learn to screen print check out this tutorial. Arg...I'm kicking myself a little for not doing better research on our photographer. I hired his company after going to a bridal show and hating every photography booth except for his. I really liked the style of his photography and decided that it was worth the significant expense. However, since then I found two online reviews, both negative. I decided that we could avoid most of the pitfalls mentioned in the reviews by having a clear list of the photos we wanted and being up front about our priorities. Well, we had our last meeting with our photographer before the wedding and it didn't go so smoothly. We have had two prior meetings, and each went amicably. In the mean time, I've had a chance to look at photographs from other weddings and decide what I want for mine. Going in to this meeting, I knew that in addition to traditional ceremony posed shots and candid reception shots I wanted photographs of the reception venue and its set-up before the guests arrive and the tables get trashed. With this in mind, I signed up for two photographers so we could get the coverage we need. Here is how things went wrong: First, he expanded the six shots we wanted for our posed session to more than 24, by moving most of the pre-ceremony shots to the post-ceremony session. Then, our photographer insisted that both he and the assistant photographer be present for our entire posed shot session, and no, one of them cannot go to the venue early to cover the reception details. Why? Because the posed shots will suffer and pictures of people are more important than pictures of things. I know he's the professional, and pictures of us with our families are a top priority, but he didn't seem to get how important seeing pictures of the (non-trashed) details were to me. Our wedding is pretty heavy on the DIY, so most of the details represent the hard work and creativity of my loved ones and myself. Unfortunately, there was no compromise on his end. My disappointment colored the rest of the meeting, and poor Mr. Lollipop tried to play diplomat, but didn't meet with much success. The short end of it is that our photographer is going to do what he wants to do and we'll need to hire a third (!) photographer to get the shots we want. Crap. It's too late to hire anyone else and we've already paid a hefty deposit. The moral here is to always check online reviews before handing over a deposit. 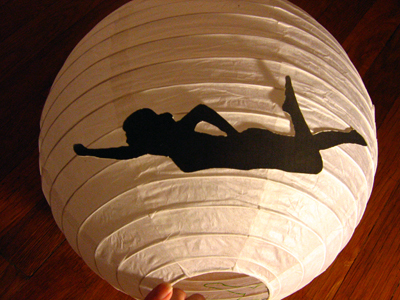 As a follow-up to this entry, I wanted to add instructions for stenciling figures onto lanterns. Today's figure came courtesy of our Maid of Honor, who did a superhero pose using a chair in her kitchen. 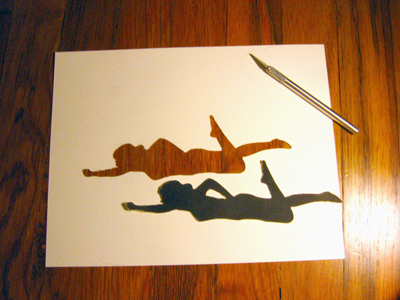 Print your Silhouette figure onto the sheet of cardstock. Cut the figure out using the craft knife. Scissors can be substituted for the knife, but they won't capture as much detail or cut as cleanly. Place a few pieces of double sided tape on the back of your cutout. To reduce stickiness and the possibility of messing up your lantern, stick the exposed part of the tape to your palm a few times. 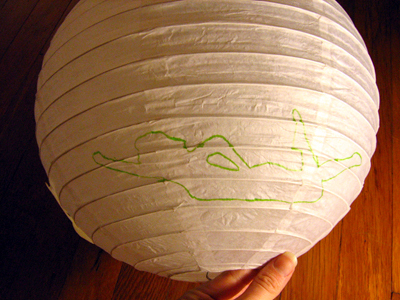 Stick the cutout to your lantern and trace around it with a pencil. Trace the pencil line with a marker for a clean edge. 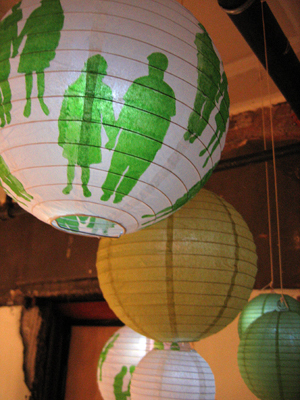 Repeat steps 4-6 until the lantern is satisfactorily decorated. 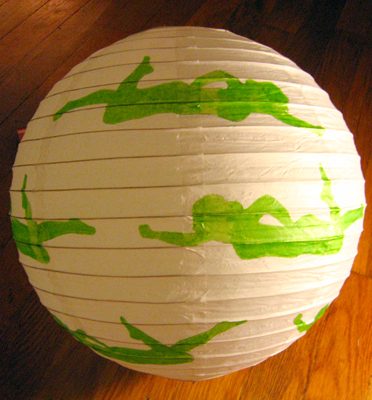 It took me about an hour and 30 minutes per lantern. Most of that time was dedicated to coloring the figures, so I delegated much of it to friends who were interested in helping. Can an Episcopal Priest marry me in a Catholic Church? Should we serve hard liquor at our wedding reception or just wine/beer? Tipping at one's wedding--to whom, how much, and based on what? What should we expect from a "day of" wedding planner? I know the traditional one year anniversary gift is paper, what are some creative interpretations of that? What should I do for a bachelorette party? I really, really like fresh flowers, but we didn't have money in the budget to pay for baskets of flowers for 20+ tables or the time to assemble them. My fiance liked the idea of using fresh fruit in the arrangements, so we experimented and found something that we both liked that would cost about $16 per table. 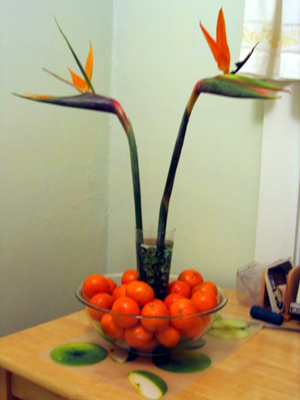 The Bird of Paradise blossoms will be about $1.75 each from our florist with a bulk purchase, and there will probably be three in each final arrangement. The vase in the center is a beer glass from Ikea (6 for $6.99), and the glass is filled with $1 of Jabo marbles purchased in bulk from ebay. The bowl is a $3 plastic punch bowl from Target*, and it is filled with a $6 crate of clementine oranges that will be purchased from a local fruit distributor. I managed to get clementines on our wedding date last year from the grocery store, so I am crossing my fingers that they will be available from the wholesale shops again. We needed something simple that could be assembled quickly by the wedding coordinators and would fit well with the reception venue. We will be sitting in an Amazon rainforest exhibit next to a waterfall, so the Bird of Paradise should work well. Additionally, the stems should be tall enough so that views across the table will be unobstructed. Mr. Lollipop also likes the idea of guests snacking on the centerpieces if they get hungry. We'll be gluing the vases to the bowls to keep them from tipping over even if all of the oranges are removed. Exactly one year out from our wedding date I decided to do a test run of our bouquets and centerpieces so I could get an idea of what was in season for September. I really wanted to do the flower arrangements myself to save money, but I had no experience at all. 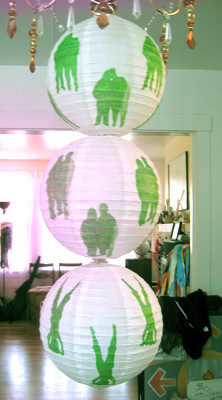 I figured that if I screwed up I could always just have the female bridal party carry books or lanterns down the aisle. To save even more money, we decided to use fruits and vegetables to cut down on flower costs. Plus, I was having a tough time finding flowers in anything other than weak, pale green shades. 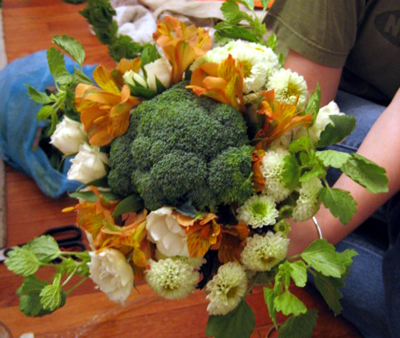 So, I decided to do a test run of the bridesmaid bouquets using green bell peppers, broccoli and asparagus. The pepper and asparagus bouquets turned out horribly because, as I said before, I didn't know what I was doing. They were asymmetrical and lumpy. However, when I tried a third time using broccoli I managed to get results I could live with. I used alstroemeria, white chrysanthemums, mini white roses and an outside layer of bells of Ireland to surround a head of broccoli in the middle. The flowers in the picture came from Whole Foods and our Maid of Awesomeness is serving as the hand model. The flowers for the wedding itself will be come from Jim Ludwig's Blumengarten in the Strip District. 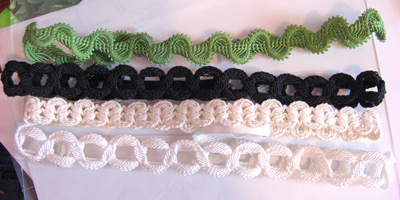 They will be selling us wholesale flowers for bouquets and centerpieces as well as pre-made boutonnieres and corsages. This will cost us about $400. Mr. Lollipop and I have an agreement about food: all of our eating expenses are covered by our joint account. We split the bill for groceries, restaurants and whatever else right down the middle. However, there are two exceptions to this rule. First, he pays for his own beer, and second, I pay for my own candy. This arrangement keeps my fiance from going bug-eyed when I bring home an entire bucket of bubble gum, or purchase and then eat an entire box of dark chocolate turtles over the course of a week. I love candy. Love it. Love it. Health-wise, I am lucky that the fillings I got in Japan (my first and only!) were not of the highest quality. The ringing in my teeth from sugary things keeps me from going overboard. I dropped soda from my diet, but I can't help the occasional sweet, sweet (*drool*) candy indulgence. It should come as no surprise that I needed a candy buffet at our reception. We will have six kinds of candy, and they will be combined with our cookie table to from a heavenly display of things that will cause my early death. 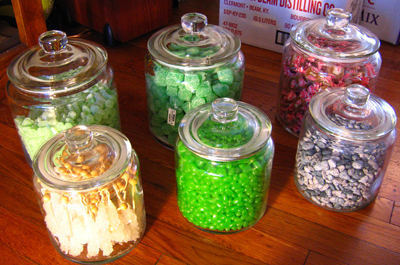 I bought all of our candy in bulk from Metrocandy.com. We be serving caramels, spearmint leaves, gummy sour apples, chocolate rocks (they look like real pebbles! ), jelly beans, and rock candy. 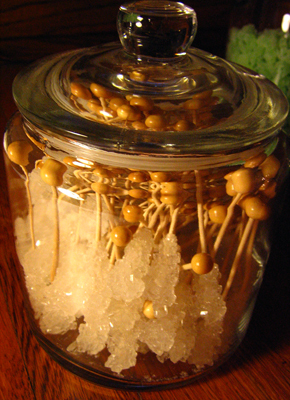 I even bought extra rock candy to be used as stirrers at the coffee table, and flavored rock candy for swizzle sticks in mixed drinks. I set out a mock-up last weekend. In addition to these six jars we will have several jars for cookies. When one of my bridesmaids and I were in our senior year of high school we were both sick of filling out college applications. To kill the monotony, we each wrote a marriage application for ourselves. Applicants would have to provide personal information and answer essay questions in order to date or marry us. My application required a credit check and recommendations from at least two non-ex-girlfriend female friends. Hers had a clause that read "Is your name Will Smith? If so, congratulations! You have already been accepted!" Yes, the 90's were awesome. So, I was amused to fill out a real marriage application at the Allegheny County Register of Wills last week. The page long form asked basic background information about ourselves and our parents. Other than that, we were required only to show our driver's licenses and swear (twice!) that we weren't lying on our application. 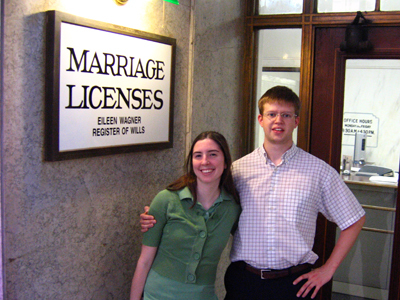 The whole process took five minutes and now we only need to wait for our marriage license to arrive in the mail. It's scary! The government knows that we're getting married! 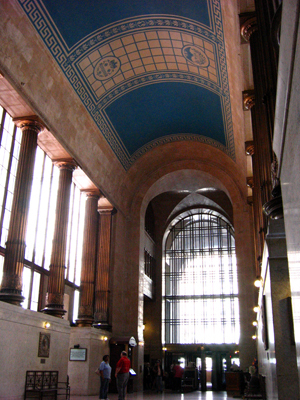 The City-County building in Pittsburgh manages to exude the regal atmosphere beyond most civil service buildings. Mr. Lollipop signs using a pen we stole from another office. We need to get something for our $45 license fee, right? Kidding. Kidding. We put it back five minutes later. We stuck a victory pose afterwards outside the office. I'm so happy to be sharing my wedding with all of you! I'll be marrying my college sweetheart this September at our church and then we will have our reception at the PPG Aquarium at the Pittsburgh Zoo. There will be penguins(!) at our reception site! I am so excited! I have been with my fiance for seven years. We met on move-in day freshman year at the George Washington University (We hail to you GW!) and we fell in love after half a year as best friends. He likes babies and animals, especially ducks, and he spent his afternoon today cleaning our grimy shower curtain on his own accord. This means that to me he is the most perfect man ev-AH. My fiance and I are both Pittsburgh transplants, but we love our city! It is much more affordable here than DC. I bought our house as a 24th birthday gift to myself on my tiny grad student salary. Plus, our local, walking-distance bars all have beer for $1.75 or less. Yay! I inherited the DIY gene from my mother and my grandmother. Thanks to inspiration from them, our wedding will be full of artsy-craftsy goodness. Luckily, the local bridal party has been very gracious about lending a hand. I am humbled to have friends who will spend four hours at a time in the studio screen printing invitations with me. I'm grateful to be a part of the Weddingbee team! Thanks for having me! How to make a wedding toast when you only know one half of the couple? Good sites for affordable bridesmaid dresses? How do you refer to a divorced couple attending a formal function together? The first reply cards have arrived! 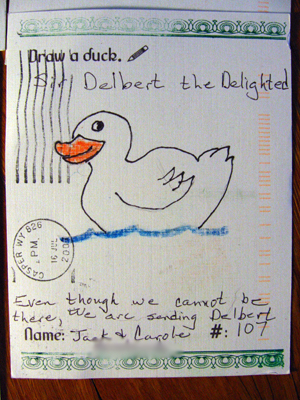 The first came from my cousin and included a lovely sketch of a duck (Clark's favorite animal) on the front. It will be our first contest entry! Yay! 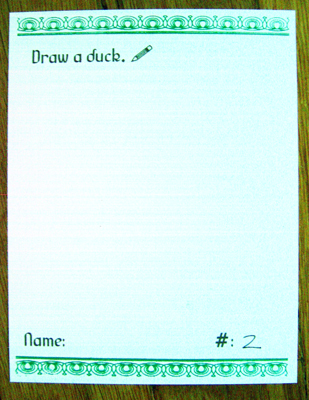 The second card came with nothing, no name, no drawing. The number attending was written on the back, but there was nothing else. Luckily, we marked each RSVP with an ID number. We just checked the spreadsheet and matched the mystery card to Clark's aunt and uncle. I [heart] Martha Stewart Weddings. I can't stand most wedding magazines, especially the ones focused on celebrity weddings*, but MSW just has the right combination of DIY and impeccable taste to make me anticipate each new issue. I call it my 'wedding crack'. I love flipping through it for inspiration, but seeing some of my own ideas, the ones I thought were completely original, on the pages of MSW will ruin my day+. Despite this, I devour issue after issue. Most of my friends managed to get married without magazines. I have failed to live up to their modern frugal woman ways. I try to read one issue of a news magazine (usually the Economist) to balance out my vapid reading habits, but now, thanks to an impulse buy, I have seven back issues of MSW on their way to me. I won them in two ebay auctions. I hadn't intended to buy them, I always get sniped out of whatever I bid on, so I expected them to go to someone else at the last minute. Five arrived today and I have been pawing through them instead of working on my machine translation system. They are so pretty and colorful and one even smells like expensive soap. The biggest problem with these magazines is that they plant ideas in my head that shouldn't be there. They put me in a fog where giving out taper candles as favors and edging 200 treat boxes with artfully cut doilies sounds like a great idea...and then I'm internet shopping...and then disaster follows. It takes a brisk walk for me to come back to reality. Yep. It's time for a walk. I almost ordered 250 green metallic Chinese takeout boxes. *That goes double for wedding television programs where people are focused on copying or outdoing a celebrity. I saw one where a woman was obsessed with topping/imitating Star Jones' wedding. Really? Star Jones? Why are you making your wedding about someone else? +I can't believe you, Martha! Screen printing favors and place mats was my idea. How could you do that to me in the summer 2007 issue? In college, I started measuring tasks based on the number of movies I can watch while doing them. When I worked as a lab instructor I would watch the Godfather movies while grading papers. The worst weeks would get me most of the way through Godfather Part III. Pain: Minimal, PotA is a classic and Charlton Heston's scenery chewing acting style is always amusing. 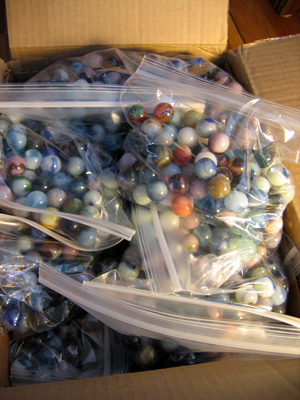 My fingers were dusty after sorting all of those marbles. Pain: Moderate, four hours of townsfolk with so much earnestness that my retinas almost detached from eye rolling. Also, four hours! I can't take bitter town life for that long. On the physical pain front, my arm was a little sore from using the circle cutter. Pain: Moderate to Severe, I should really learn to avoid all Lindsay Lohan movies outside of Mean Girls. 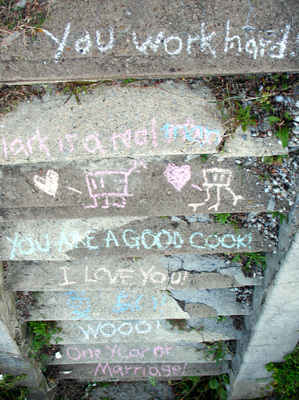 This one was especially insipid and saccharine. The physical pain was minimal, just a sore back from sorting toys for hours on the floor. Luckily, there were brightly colored doodads to distract me. Shoes! I purchased four pairs from Zappos.com, from the fancy and painful, to the plain and painful. Happily, I found one pair that feels like a dream on my feet. They are ballroom dancing shoes and they have extra padding to keep by feet happy for hours. They are the only pair of heeled shoes that have ever I owned that feel ready to be worn in a 5k race. 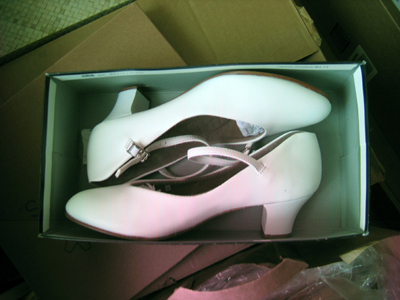 Unfortunately, Zappos only sold its white ballroom shoe in a non-leather version, so they look a little like plastic Barbie shoes. My wedding dress should cover them for most of the night, but I plan on wearing them with my much shorter getaway outfit. It would be a pain to lug a second set of shoes to the reception and I hope everyone will be too drunk to dwell on the less than perfect texture. Update: Arg! I just learned that Zappos has a new leather version of my shoe! The first round of invitations have been mailed. Phew! Even with three people working for most of the Fourth of July, we only got through the first 50 out of the full 150. 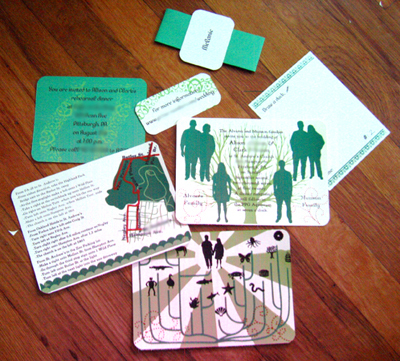 90 have now been completed and we are still faced with one more day of printing, cutting, addressing and stamping. This is our last major task before getting married, and the biggest time commitment so far. I think we spent less time in premarital counseling than we did on these things. Luckily, we have the food, bridal party, clothes and location locked down. Now that we have notified everyone we are left with just minor tasks before the big day. Even if those don't get done we can still show up and get married and feed everyone. 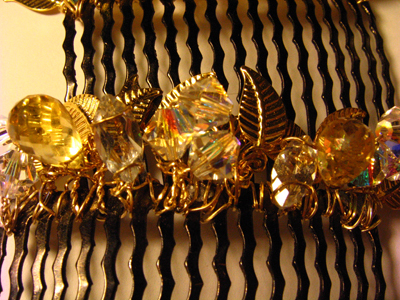 When it comes to clothing or hair accessories, I usually know what I want. When I go shopping I search for the things that match the picture in my head. If I can't find what I want or the closest match is too expensive, I'll make whatever I need myself. Usually, I'm able to make what I want with acceptable results, but it often takes a considerable amount of time. I knew exactly what I wanted for my wedding hair accessories: I wanted them to be in gold tones to match my dress, I wanted something botanical with leaves, and I wanted two hair combs instead of a tiara. Not that there is anything wrong with wearing a tiara; they just aren't my style. After shopping with grim determination I couldn't find anything approaching my ideal combs. Even distant matches carried a $100+ price tag for rhinestones and brass. Instead, I resolved to make my own. My supplies came from Fire Mountain Gems, but I purchased them through a local store called the Rock Shop so I wouldn't have to put in a bulk order to get the maximum discount. I bought gold filled wire, AB Swarovski crystals, citrine drops (my birth stone), and marquise cut topaz (also a birth stone). To fill in the background and add a botanical look, I added metal leaves. My camera is broken, so the resulting pictures are less than optimal. 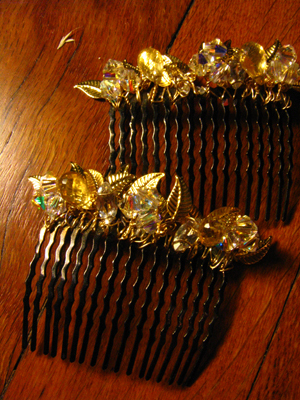 The resulting combs, however, turned out well. They sparkle a lot in the light and make my inner magpie happy. My 'getaway' dress was once supposed to be my wedding dress. On a trip to Thailand two years ago, one year before my engagement, I had the top secretly made at a tailor's shop while attending a Machine Translation conference alone. I had been with my (now) fiance for about five years. At the time, I'd imagined a much more casual wedding, possibly with a bowling alley reception. So, I went to the shop, gave them a sketch and it was in my hands three days later. My wedding has changed to a much more formal affair and my simple bowling-ready dress has been replaced by a beaded number with a train. However, it would be a shame to let such a pretty silk top go to waste. Now, it will be what I change into when my wedding dress gets to be too cumbersome at the reception. 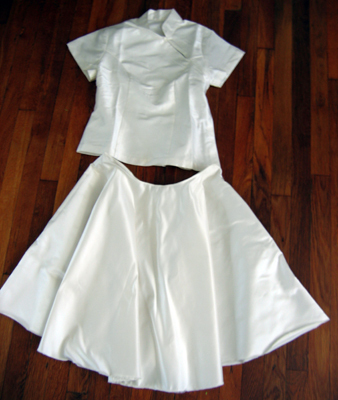 I purchased matching silk after my aborted New York Father's Day trip and made a knee length circle skirt to complete the outfit. 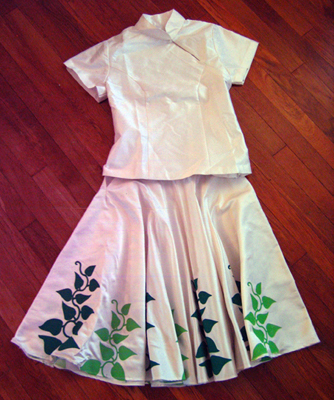 Just to add some character, I drew a picture of a vine a few days later and silk screened it around the hem. I have just a few things that belonged to my grandparents on my mother's side. They had 18 children and 40+ grandchildren, so their possessions were stretched a bit thin when they died. That's why I feel really blessed to have things from them that mean a lot to me. First, I have my grandmother's sewing machine. She sewed blankets and stuffed animals for all of her grandchildren. Every year at Christmas she would send everyone a box full of handmade goodies. When I was in elementary school and obsessed with dinosaurs she sent me a 3 foot long stuffed green brontosaurus. I've been using it to sew a few things for the wedding. I've made my reception headband on that machine as well as part of my getaway outfit, and all of these things inherit Grandma Power. I'm hoping that her power is to convey long, happy marriages and not child production, although she was a champ at the latter. The second thing I have from my grandparents is a plastic Virgin Mary statue. You see, they were really, really Catholic (as if the number of children didn't give that away), and the plastic statue stood on their staircase landing for as long I as I can remember. When my grandfather died my family had a special ceremony and bestowed it on my aunt Cathy, the oldest of the 18 offspring. Eventually, it was passed along to me and I had to whisk it away before my other relatives found out and challenged me for it. It's cheesy, but I love my Blessed Virgin Mary and she stands at the top of my steps. She'll also be standing on the altar at the ceremony as a tribute to my grandparents. I like to think that our wedding has special effects shots. We have been using a green screen to capture silhouettes of us and the members of our bridal party. It's been really fun getting everyone to pose and I like the idea of our decorations as more about the people close to us rather than just about me and my fiance. 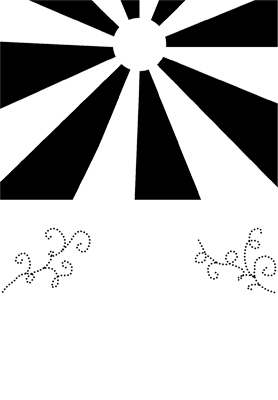 We'll be screen printing the resulting images on our invitations, stenciling them onto lanterns and incorporating them into our other decorations. 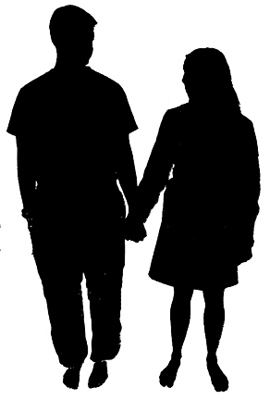 The silhouettes are simple enough to lend them well to a variety of media. The other advantage is that with the right pose silhouette figures can make anyone look good, even if they are making a funny face or wearing a stained shirt. 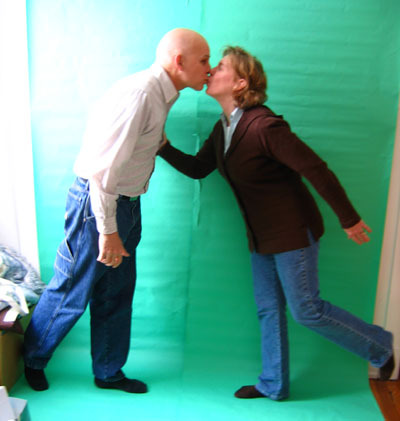 We used the following improvised green screen method to get our shots. First, we bought a roll of green paper from Staples (~$7 if I recall correctly) and temporarily attached it to our dining room wall with masking tape. We left a little on the floor to stand on so our entire figures, from head to toe, would be surrounded with an easy to remove color. Next, I imported our digital photos into Photoshop and used the magic wand tool to select all of the green area. Using the brightness/contrast controls I turned the brightness all the way up until everything faded to white. Next, I inverted our selection and turned the brightness all the way down to deepen our color to black. 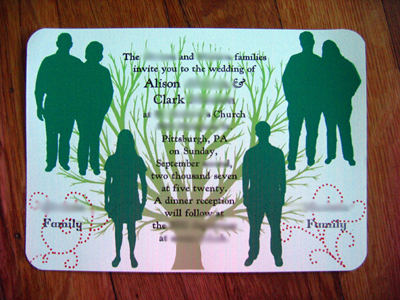 Stay tuned for our silhouette invitations and more silhouette decorations.